Laura Marlin the plucky young detective is back in this new adventure, joined by her best friend Tariq. A planned picnic is never simple for someone like Laura and when her Uncle narrowly avoids an overturned horsebox abandoned on the roadside, the reader is plunged into a fast-action narrative which spans Cornwall and Kentucky. When the broken horsebox turns out to contain a stolen racehorse worth $75 million, Laura and Tariq are involved in helping to care for the horse and trace its owner. The action then moves to Kentucky, the horse’s home, where skulduggery has left the Wainwright family close to bankruptcy. Thanks to Laura’s sharp eyes and Tariq’s skill with animals, they are able to foil another kidnap plot and save the Wainwright’s farm. 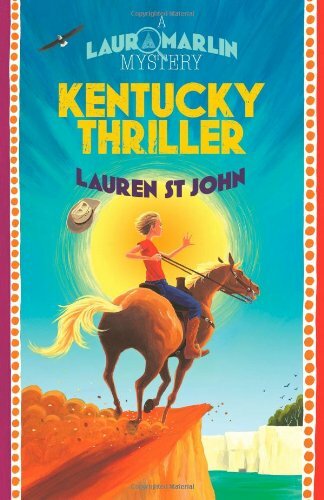 As with other Laura Marlin novels, the setting of Kentucky and the murky world of horse racing are meticulously researched and the attention to the detail of plot and setting are impressive. Each cliff-hanging chapter ending pushes the narrative forward. Powerful writing immerses the reader fully in the adventure, experiencing everything from Kentucky hospitality to the terrors of the haunted house. This is a must-read for Laura Marlin fans or anyone who enjoys a well-written, carefully planned mystery adventure. It is suitable for independent readers and would appeal equally to boys and girls.